This week a user on gamer website MMO-Champion noticed that Blizzard Entertainment (creator of popular MMORPG World of Warcraft) had, on July 28, applied to register the phrase "Mists of Pandaria" as a trademark. 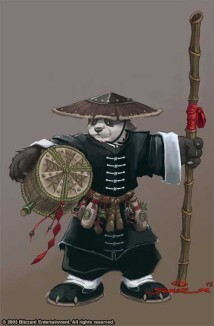 This lead to speculation that the next WoW expansion will centre around Pandaria, the home of the Pandaren, a race of anthropomorphic beer-loving pandas who first appeared as an April Fool's joke in the leadup to Warcraft 3. At this point it is not clear if the application is a genuine clue to Blizzard's future plans, or a piece of misdirection. Nor can anyone, at this point, say if WoW players might get "a chance to play furry alcoholic martial arts masters".